We have been reviewing a number of Little Live Pets products and the latest one is the Surprise Chicks House and the Surprise Chicks packs. 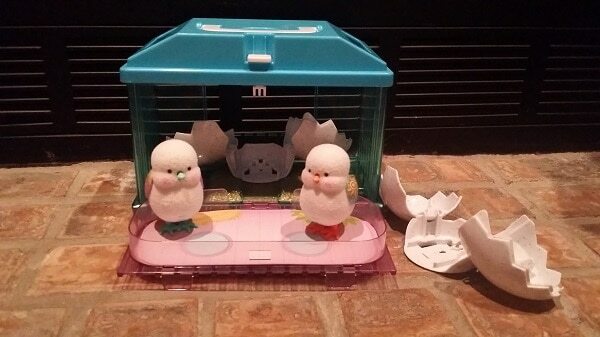 The Little Chick house is the perfect place for your Chick to hatch. 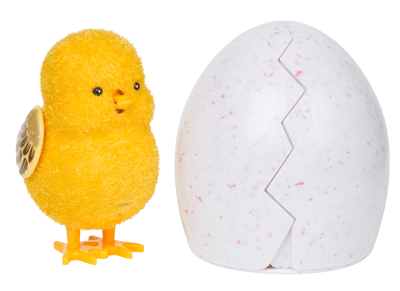 Place your Surprise Chick egg inside their house and keep them safe ‘n sound as you carry them ͚round! Then, once they’ve hatched, fold down the wall and watch them explore! It’s the best little nest in town! The Surprise Chicks House itself does not take any batteries. The Surprise Chicks do take button batteries. The Surprise Chicks House comes with one egg and surprise chick inside. Any additional chicks can be collected separately with the Surprise Chicks packs. Who will hatch out of your egg? Little Live Pets Surprise Chicks are about to say “hello”! You’ll be attached as soon as they hatch! The fun part is you just don’t know when they will crack open! Will you get the limited edition golden chick?! Watch them come out of their eggs and hop around on their legs. These cute Lil’ Chicks love to chirp, hop and play all day. Put them back in their eggs and watch them hatch over and over again! The chicks have an on and off switch. They also have a petting sensor on the top of their head. The chicks love to be pet on their sensor area and will chirp and tweet. If you keep petting the chick it gets happier and happier until it starts tweeting a tune. The chicks hatch out of their eggs and can be put back in to hatch again if you follow the included instructions. Once the chick has hatched, they hop all around. They will hop around the Surprise Chicks House and out into the garden area once they hatch and the door of the house is opened. The house also acts as a place to store the chicks and to carry them around in. The Surprise Chicks House comes with one surprise egg with a chick inside. Other Surprise Chicks can be purchased separately. There is also what they call the golden chick to collect. The chicks are a fuzzy type of fabric and contain batteries, so if they need a cleaning at all, they need to be carefully wiped with a damp cloth. The instructions say you can use a suede/fabrich brush to brush them clean as well if need be. The Surprise Chick House can also easily be wiped down with a damp cloth. The age ranking is for ages 5 years old and up. I agree with the age ranking. Any younger and they might not be able to take the care needed with the more gentle parts such as the legs or beak of the chicks. 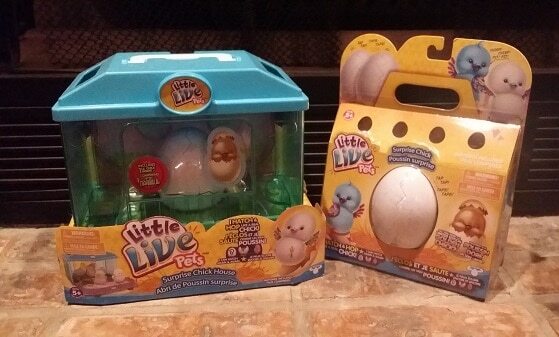 The Little Live Pets Surprise Chicks House and Surprise Chicks can be found at Toys R US, Walmart, Mastermind Toys, and London Drugs.